With the celebration of Labor Day 2016 comes the official end of the Summer of 2016, a very sad occurrence for me as I truly enjoy Summer. Reflecting over the Summer of 2016 the one word that comes to mind is . . . Marathon. Of course the "Marathon" labeling could be more a personal experience; although, I am sure there are others who have experienced a "media" marathon summer too. The local cable/wifi service enabled viewing (from the very beginning to absolute final second and beyond) the two political conventions. Each historical convention consumed a total week of local, national, and international cable coverage. Granted if one were to actually tally up the total coverage time dedicated to the candidates, selecting the candidates, and reviewing each candidate's qualifications and lack there of I am sure we would be talking months and possibly years. That's all the political comments you will read from me. Next came the Olympics providing us an additional two weeks of entertainment from morning to midnight and, one again, beyond. We were able to witness/enjoy the competitions, the training, the personal history of Olympians, while experiencing a virtual visit to Brazil, especially Rio. Then it was onward to the U.S. Open and tennis. Tennis used to be a calm, relaxing sport to watch with the broadcasters whispering the movements of the participants accompanied by the rhythmic bouncing of the ball but this year I noticed a louder participation from the crowd which distracted from the peace I was seeking. How does one cope with all this stress-generating entertainment? My answer to this question was TEA and books. Summer in Pennsylvania brings heat, and this year, very high humidity. Although I do enjoy a hot cup of tea my preference had to be iced tea with lots of ice. Interestingly, I found that fruit blended/flavored Oolongs provided a refreshing glass of iced tea made with the cold-steeped process. (My favorite iced tea was Rhubarb Oolong by Teasource) The Pennsylvania summer encouraged preparing beverages and meals with as little additional heat as possible. I found myself adding a shot of Matcha to my iced tea, providing that shot of theanine I so badly needed for survival. Here again I turned to Teasource to sample their flavored Matcha. My absolute favorite would have to be their Raspberry Matcha in a RTD peach tea over lots of ice. Do you remember Peach Melba? Once I had a very large glass of iced tea prepared, it was time to select the book(s) that would provide me inner peace or an escape. Here, the selection wasn't nearly as easy as choosing a tea to ice. Being the tea/mystery/foodie/fashion book person that I am it is sometimes difficult to choose which book to read first. I never have difficulty selecting books to buy, especially mysteries. All I have to do is make a trip to the Mechanicsburg Mystery Bookshop for a recommendation on a series or author that I would enjoy. My summer reading authors went from food author Ruth Reichl to new author Radha Vatsal (A Front Page Affair), with the in-the-middle coping devices being Consider The Fork, The Perfume Collector, An Edible History of Humanity, Murder on a Designer Diet, and Rhys Bowen's latest Royal Spyness Mystery just to mention a few. As you can see I was reading books that would put my consciousness in another world . . . A world of peace, calm, and less stressful times. Now that September is underway I am finding myself surrounded by the activities of yet another marathon -- football, college is the game of choice in our house. Well, at least the weather is cooling and I will be able to enjoy my favorite hot Pu'erh, oolong, and green teas. No matter the time, the place, the activity, or the weather there is always a tea that compliment the situation. 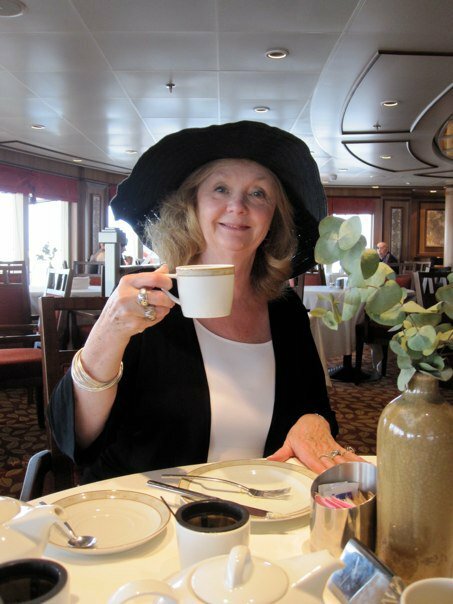 The Tea and Hat Lady is an STI Certified Tea Specialist concentrating on blogging about how tea continues to influence her life-style through tea adventures, discoveries, and wellness. Aug 17 Simplicity -- A Lost Art?